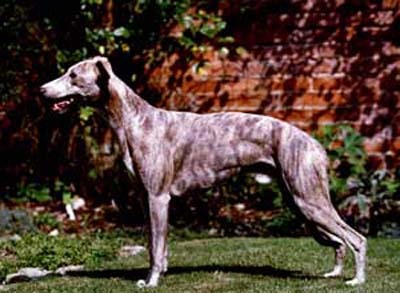 As with all Moonlake litters, the primary occupation of the puppies, apart from being much loved pets, was intended to be on the coursing field which meant that size was critical - whippets over 20" were not allowed to compete. 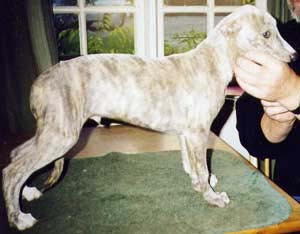 A brindle male puppy had been booked by a coursing enthusiast but to my relief, when she came to collect him, she chose instead a much smaller, parti-coloured brother (who grew to be the biggest of all). 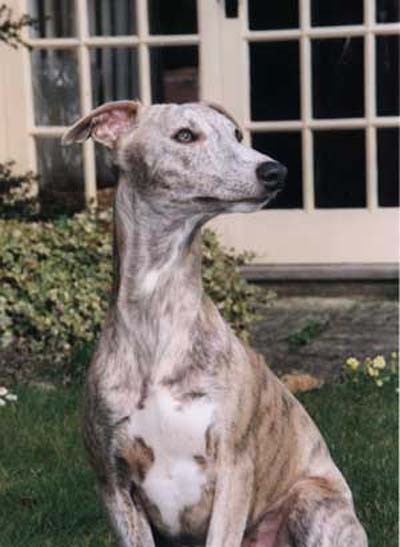 It was apparent to me from an early age that Splash was something special although most whippet friends and many judges preferred his brother, 'Tosh. 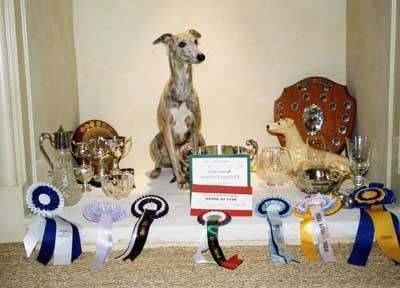 I was happy with his second place at their first show (while 'Tosh was BPD from Maiden) and from then on, he was a consistent winner, culminating for me as BPIS at the Whippet Club Centenary show. 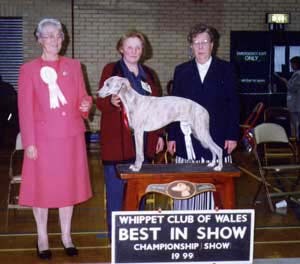 A first CC and Best in Show from Junior at the Whippet Club of Wales followed (thanks to Judge Betty Beaumont and Referee Isobel Dyke) and all seemed set fair until disaster struck. 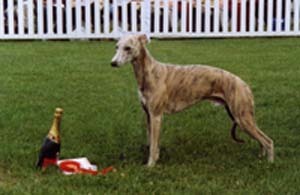 After his Welsh win, I had stopped coursing Splash (he had divided the East of England WCC Puppy Cup with 'Tosh - dogs in the same ownership are not allowed to run against each other) but was eventually persuaded, against my better judgment, to enter him for the Whippet Coursing Club's Puppy Cup to make up the numbers, in spite of the fact that he was neither prepared nor fit for the event. 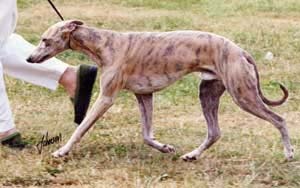 Running in his usual death-or-glory style, Splash tore a gracilis muscle so badly, it was evident he would never run again. After months of laser treatment, physio and swimming, Splash was back in the ring although it didn't take much for the scar tissue to break down and affect his movement. 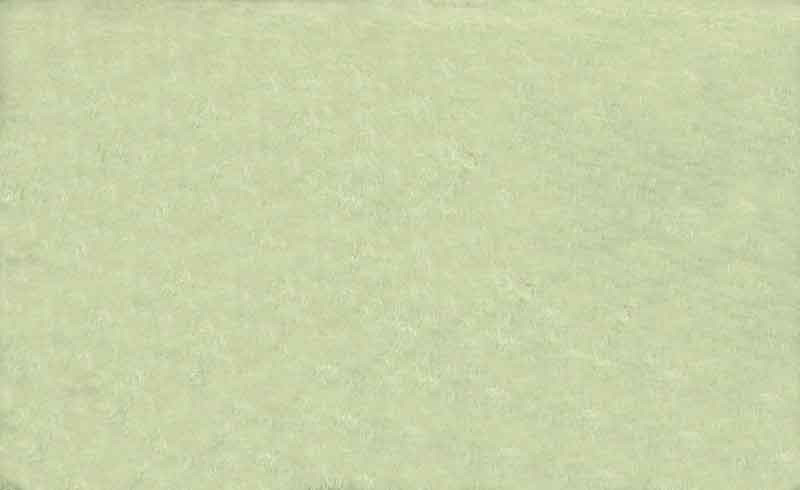 My anxiety travelled down the lead and more often than not, the pair of us stood there, looking as if the sky were about to fall on us. 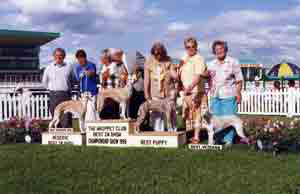 When we managed to lighten up, things went better and a second CC was won at Paignton under Pat Brown, a BIS at the Whippet Club Open show and some other nice wins - it didn't help that at championship shows we were competing against the breed record holder. 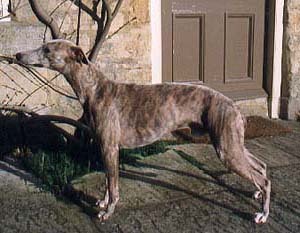 A happy trip to Northern Ireland brought that elusive third CC, under June Minns but five days later, Splash was dead. 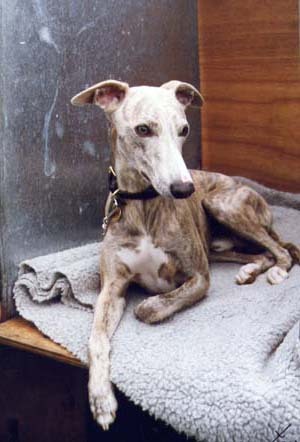 Although sorely tempted, I had not kept anything from the lovely litter that Phoenix had by Splash to prove him, as I was moving house at the time but I was lucky enough to get a puppy from his last litter so I have a little bit of him left. 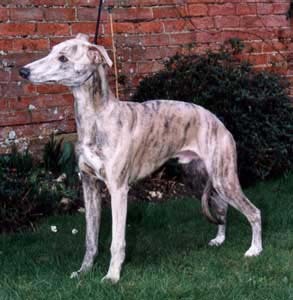 I don't suppose I shall ever have again a dog that fills my eye in the way Splash did but I count myself lucky to have had even for a short time such a beautiful dog and ideal companion.